PRE-REGISTRATION IS REQUIRED. 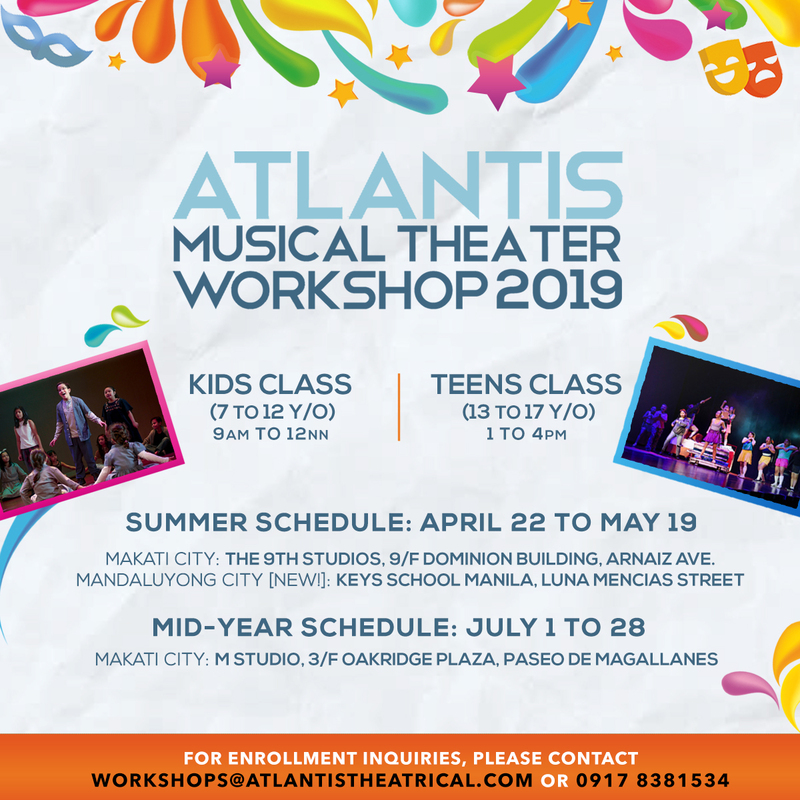 Contact workshops@atlantistheatrical.com or +63917 8381534 to sign up. The Basic Musical Theater Workshop will introduce students to the rudiments of singing, acting, and dancing for theatre. As an introductory course, it aims to instill in its students a broader understanding of how to use their bodies and voices in performance along with exploratory activities on character work and script analysis. The Basic track also features Jazz dance classes for students who wish to strengthen and hone their skills in stage movement. For ages 18 and above. The Intermediate Musical Theater Workshop focuses on the journey of the song. It caters to students who already have prior experience with theatrical performance and aims to lead them in discovering how to dissect their music and lyrics, enabling them to strengthen their performance and start developing ways of deepening their understanding of theatrical text. The class also features an introductory course in tap dance led by Atlantis' choreographer extraordinaire Cecile Martinez. Through this course, we aim to raise and bring out even more triple threats prepared to face a professional career in the bigger world of the stage. Students will be selected via teachers’ recommendation and/or a video audition process. For ages 18 and above. 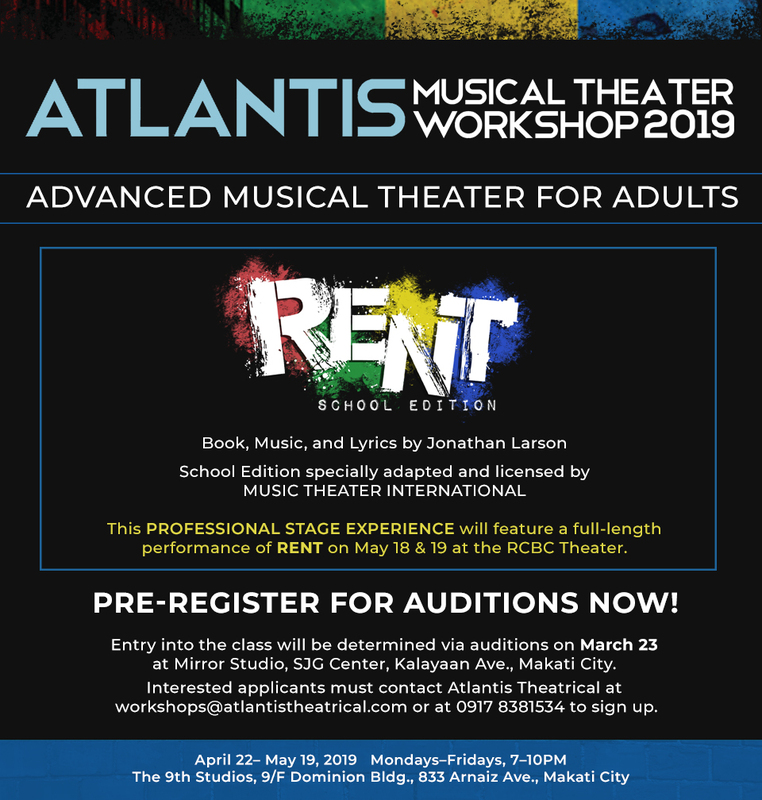 For inquiries and application guidelines, contact Atlantis at workshops@atlantistheatrical.com or at 0917 8381534.